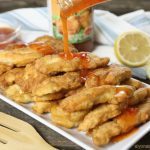 Sweet & spicy Asian chili sauce is smothered over fluffy breaded chicken strips creating one absolutely delicious and sticky Asian Chicken Fingers dish! This is my favorite chicken strips recipe! If you can say that fast enough than you can probably make these super easy chicken fingers! No really it’s that easy. 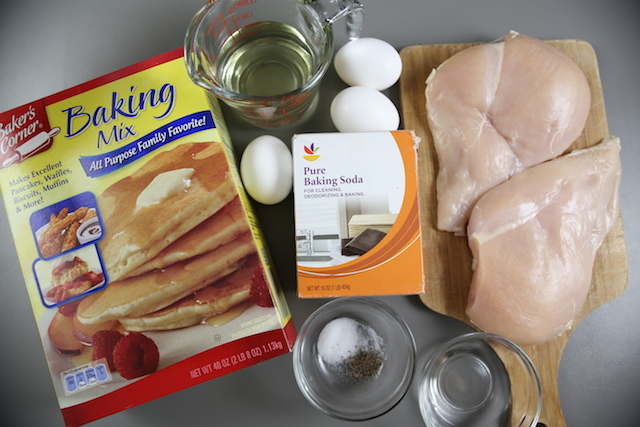 The batter has only 2 ingredients (as you are only whisking a baking mix & eggs) then frying. Not only are these chicken fingers so fluffy but the meat itself is so tender as the baking soda and vinegar REALLY TENDERIZE the meat. You will NOT detect any soda or vinegar in the meat but this works wonders for tenderizing meat. A big thanks to my aunt Nadia who shared this wonderful recipe with me (and helpful meat tip). Serve these with Mae Ploy Sweet Chilli sauce and you have one incredibly delicious chicken dish! Chicken breast vs Chicken tenderloin? Chicken tenders are from the same area of the chicken as breasts. The breast being the upper layer of meat and tenderloin the layer under the breast. Either one will work the same for your recipes because it is essentially the same kind of meat. In this recipe we are using the breasts, but if you have tenderloin, just use the same amount, and get identical outcome! 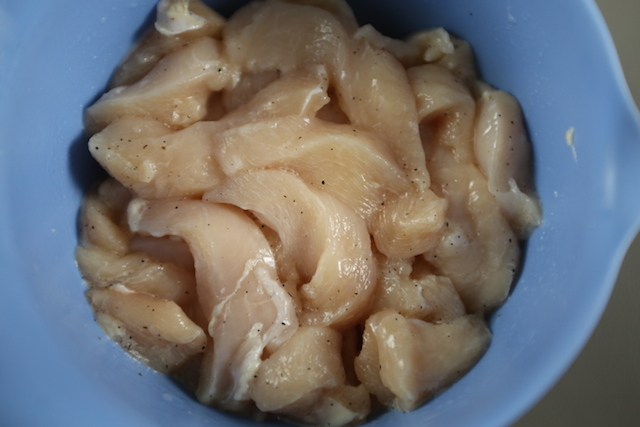 Cut the chicken in crosswise strips then slice each strip in half; place into a bowl. 2. Sprinkle baking soda over the meat then add the vinegar (the combination should fuzz). 3. Add the salt and pepper and mix to combine. Set aside. 4. Heat oil in a large skillet over med-low heat. 6. Place all the chicken pieces into the batter and stir to incorporate the batter into the chicken strips. 8. 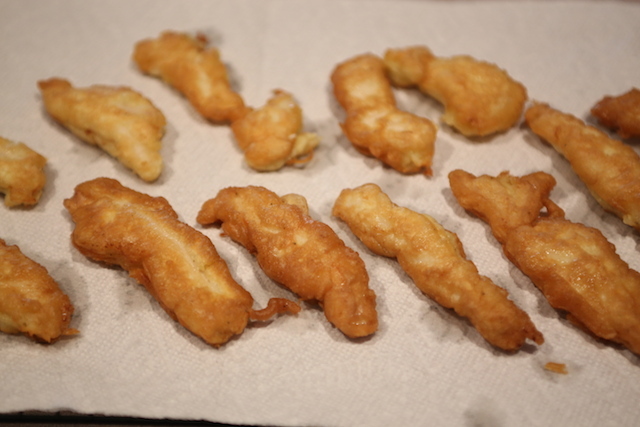 Transfer fried strips onto paper towels and continue to work with remaining chicken pieces. 9. 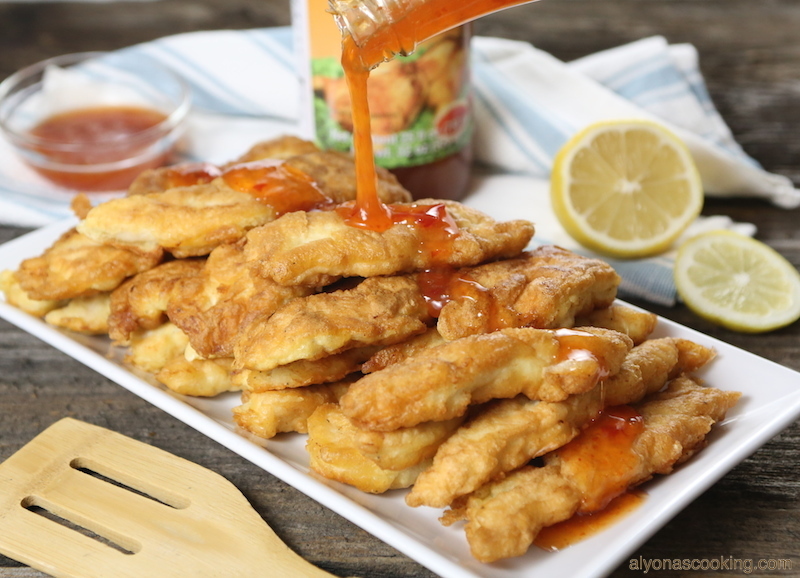 To serve arrange chicken fingers onto a plate and drizzle sweet Asian Chili sauce over the chicken. ENJOY! 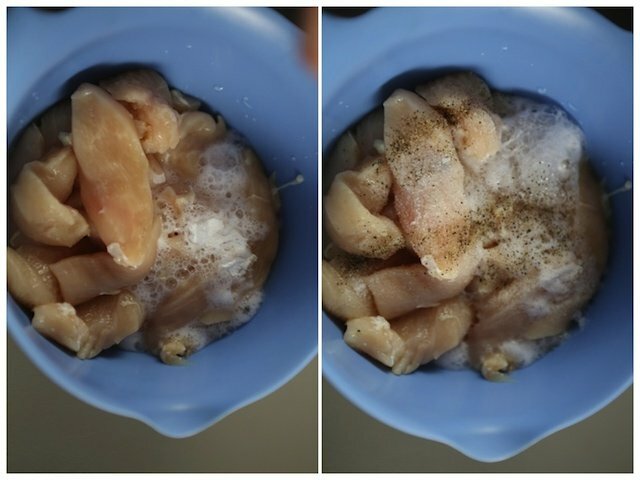 Cut each chicken breast in crosswise strips then slice each strip in half; place into a bowl. Sprinkle baking soda over the meat then add the vinegar (mixture should fuzz). Add the salt and pepper and mix to combine. Set aside. Heat oil in a large skillet over med-low heat. 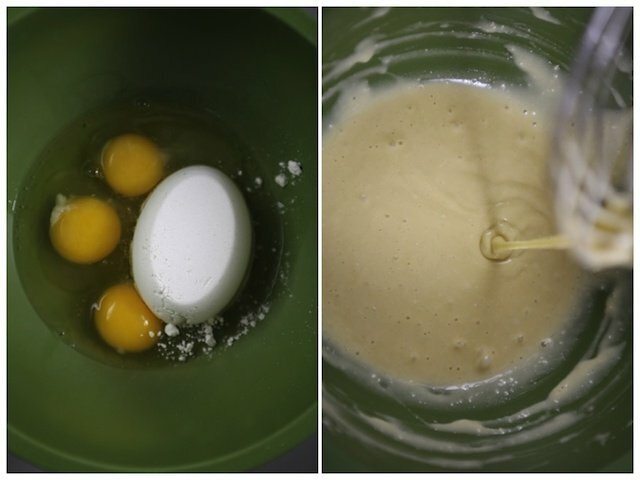 TO MAKE BATTER: Whisk together the dry baking mix and 3 eggs until smooth. 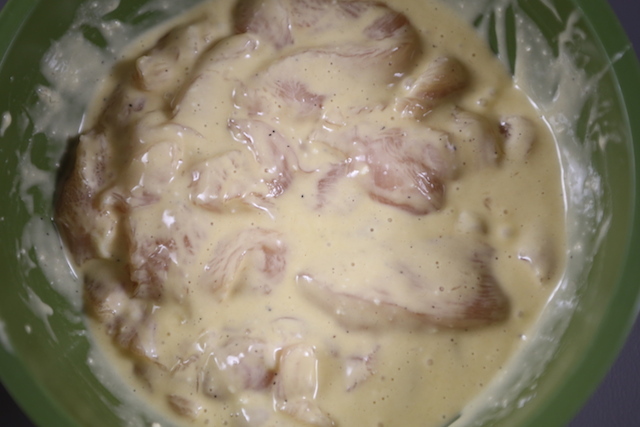 Place all the chicken pieces into the batter and stir to incorporate the batter into the chicken strips. 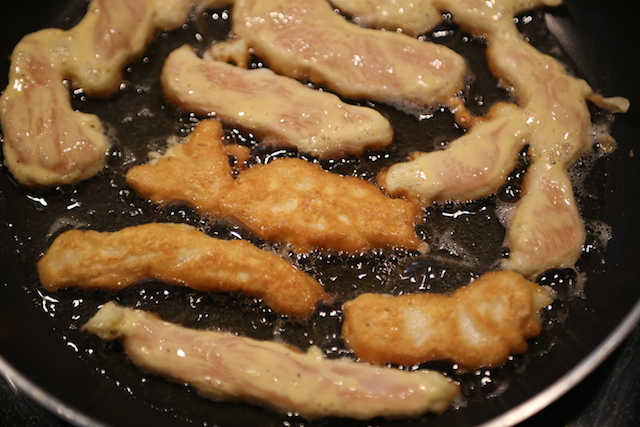 Place chicken strips in the preheated skillet one piece at a time and fry 2-3 minutes on each side or until golden. Transfer fried strips onto paper towels and continue to work with remaining chicken pieces. 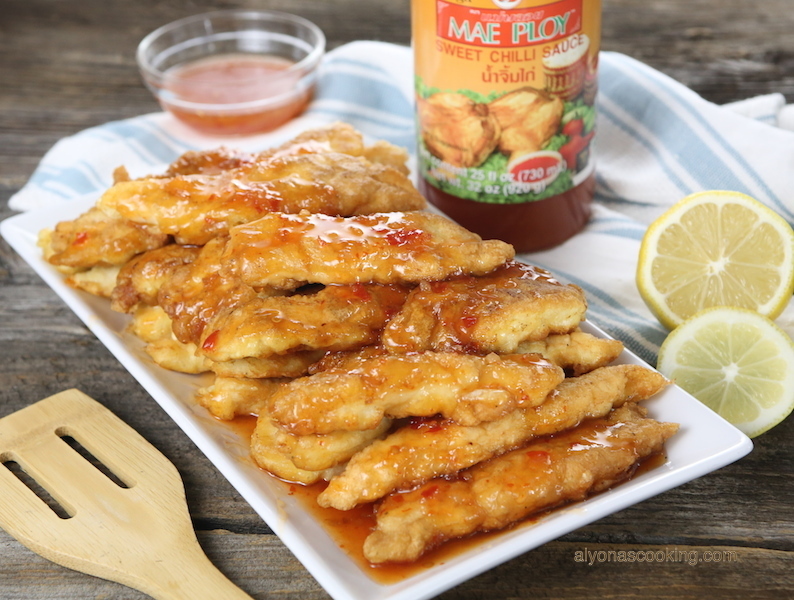 To serve arrange chicken fingers onto a plate and drizzle sweet Asian Chili sauce over the chicken. ENJOY! I made a double batch of these today for dinner and my family loved them! They are seriously so soft and yummy! My new go-to Asian recipe!! Thank you so much Alyona! 5 stars! I too am hesitant about baking mix i dont buy that kind of stuff, but I will google a homemade making mix recipe and try these. Thanks!!! Thank you for taking the time to comment. You can certainly make a home made baking mix. I believe it usually consists of shortening, flour, and rising agents. Please let me know how it turns out. These Asian chicken fingers tasted amazing and delicious! This recipe is the best recipe I have tried for Asian chicken fingers. Do you think it would work with using just regular all purpose flour or is the baking mix a key here? You can certainly use flour, however they may not be as fluffy since a baking mix usually consists of a rising agent (like baking powder) and other ingredients flour may not have. Any generic brand baking mix will do as long as it’s all purpose.